Erik Henningsen (1855–1930), The Thirsty Man (1900), lithograph poster for Tuborg Beer, 92.8 x 66.4 cm, location not known. Wikimedia Commons. If you have ever enjoyed a cold Tuborg beer, you may be familiar with this classic poster advertising it. 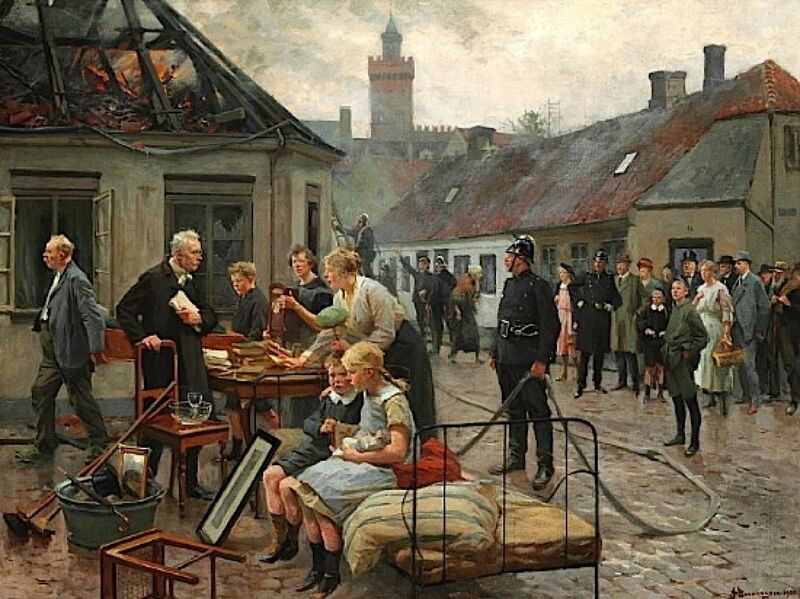 It is now the only well-known work by the Danish ‘social realist’ painter Erik Henningsen (1855–1930). This article looks at some of his other surviving work, which may not quench the same thirst, but was far more important at the time. Henningsen was born in Copenhagen, and his potential recognised early. His father, a grocer, had him apprenticed to a decorative painter, and he had private drawing lessons too. As a result, he was successful in being admitted to the Royal Danish Academy of Fine Arts in 1873. He graduated from there in 1877, and pursued a career as an illustrator as well as a painter. During the 1880s, he was a member of a group of realist artists who tried to encourage debate through their art, in the hope of creating a better society. Erik Henningsen (1855–1930), Summum jus, summa injuria. Infanticide (1886), oil on canvas, 78.5 x 117 cm, The Hirschsprung Collection, Copenhagen, Denmark. Wikimedia Commons. His first major painting appears to have been this, with the enigmatic title of Summum jus, summa injuria. Infanticide (1886). The Latin quotation comes from Cicero’s De Officiis I, 33, and literally means the highest law, the greatest injustice. It is a warning still used that strict application of rights and the law carries the danger of doing some people a huge injustice, and Henningsen’s narrative is an important example of a serious social and legal problem at the time. Two labourers are digging a small pit at the side of a track across sand dunes. They are supervised by two policemen, one of whom keeps a written record. Behind and to the right is another policeman who holds a young woman by the elbow. She looks down as she is petting a dog. The subtitle provides the clue as to what is going on. The labourers are trying to find the body of a baby, who is the subject of a police investigation. The young woman is the child’s mother – unmarried, she had the baby in secret, smothered it at birth, and disposed of its body. She knows that if her baby is discovered, her punishment will be severe. But this was the only course open to her, as having a baby out of wedlock was against accepted religious and moral standards of the day. Erik Henningsen (1855–1930), Farmers in the Capital (1887), oil, further details not known. Wikimedia Commons. The following year, Henningsen courted less controversy with his Farmers in the Capital (1887). This shows a country family who have arrived in Copenhagen, complete with a large chest and their farm dog. Around them city-dwellers dress more fashionably, and stare at the outsiders with their rough clothing and filthy wooden clogs. 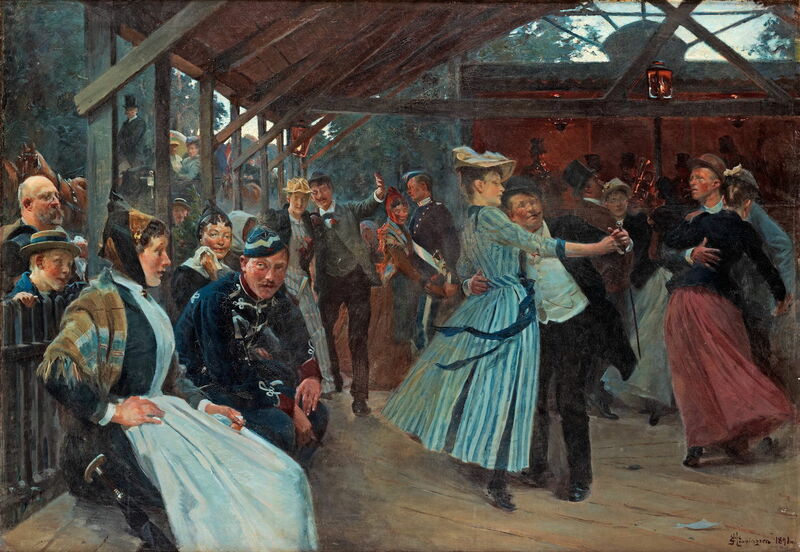 Erik Henningsen (1855–1930), The Dance Pavilion (1891), further details not known. Wikimedia Commons. The Dance Pavilion from 1891 show a festival of social awkwardness, a summer’s evening dance, with its curious mixture of participants. The backgrounds of each are revealed by the style of their clothes: young women from the country still wear dull-coloured shawls and aprons, while the more sophisticated wear fashionable dresses and exuberant hats. In the left background is a carriage and pair of horses driving past, the coachman wearing a top hat with tails, and his passengers dressed up in their finest. Erik Henningsen (1855–1930), Evicted (1892), oil on canvas, dimensions not known, Statens Museum for Kunst (Den Kongelige Malerisamling), Copenhagen, Denmark. Wikimedia Commons. 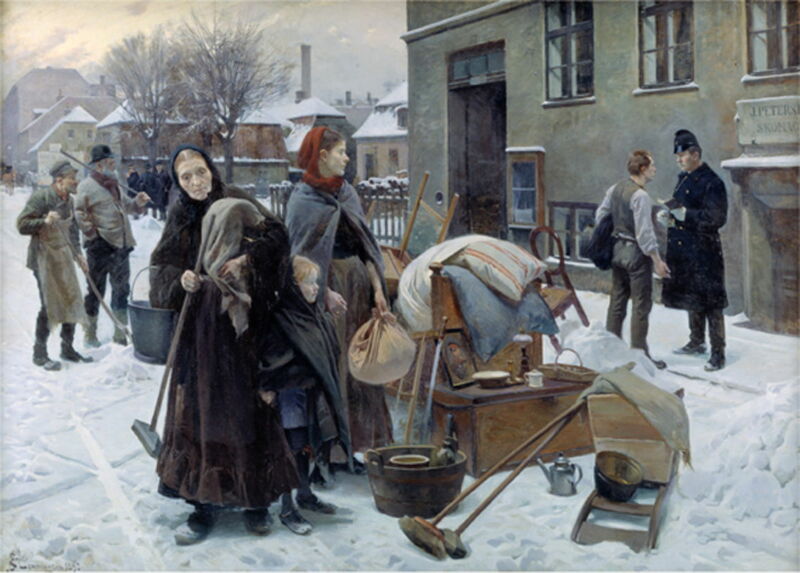 Evicted from 1892 returns to a theme more appropriate to ‘social realism’, as a family of four is evicted into the street in the winter snow. With them are their meagre possessions, including a saw suggesting the father may be a carpenter. In the background he is still arguing with a policeman. 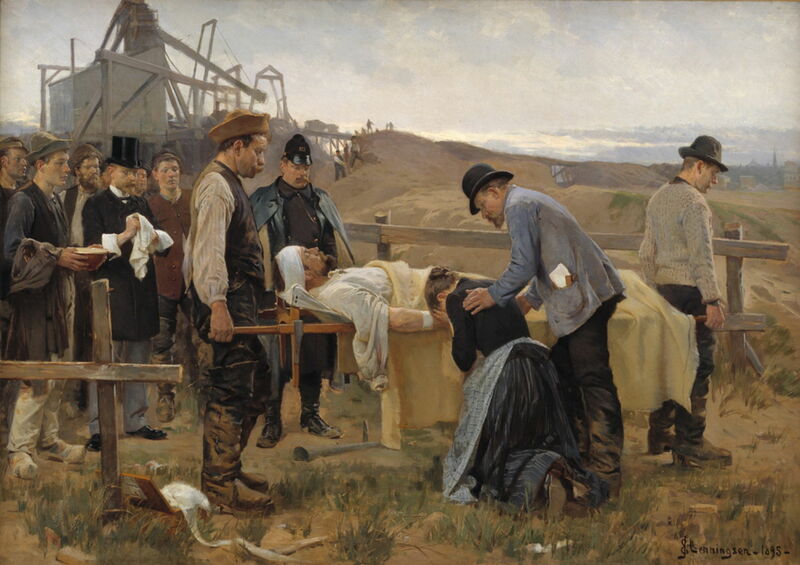 Erik Henningsen (1855–1930), An Injured Worker (1895), oil on canvas, 131.5 x 187 cm, Statens Museum for Kunst (Den Kongelige Malerisamling), Copenhagen, Denmark. Wikimedia Commons. In An Injured Worker (1895), Henningsen tackles another major social issue. The scene is a gravel or sand pit outside a town (in the distance at the right). A worker has been injured there, and is being carried away on a stretcher. By his side is his wife, who is in tears and being comforted by one of her husband’s managers. Behind and to the left are a policeman, and a doctor who wears a top hat and is wiping his hands after dressing the man’s wounds. 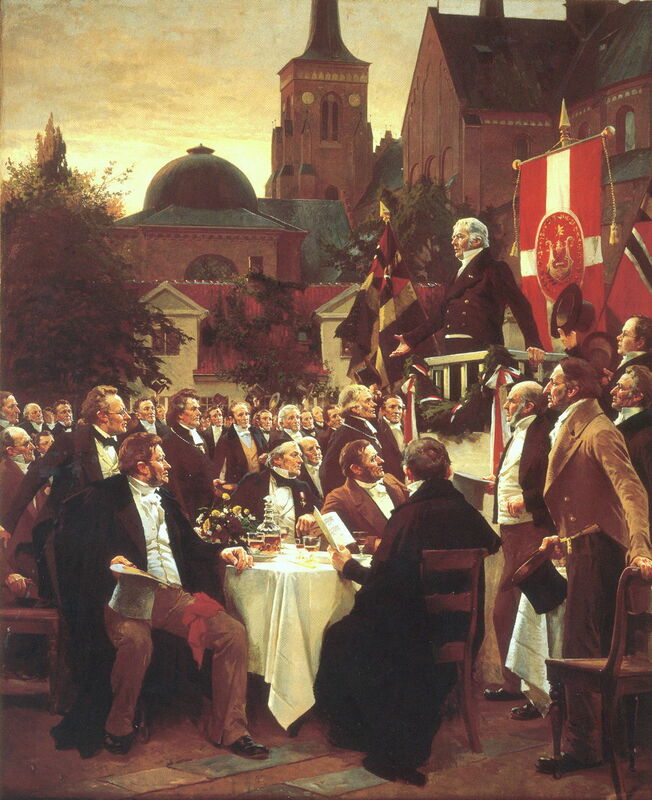 Erik Henningsen (1855–1930), The Nordic Natural Science Research Meeting 14 July 1847 (1895), mural, dimensions not known, Aula, University of Copenhagen, Copenhagen, Denmark. Wikimedia Commons. Henningsen’s realism was appreciated by institutions such as the University of Copenhagen. In 1895, he completed a mural in the Aula of that university showing a major international event, The Nordic Natural Science Research Meeting 14 July 1847. Presiding was the great Danish physicist and chemist Hans Christian Ørsted, who was nearly seventy at the time. Erik Henningsen (1855–1930), An Agitator (1899), oil on canvas, 120 x 180 cm, Metalskolen Jørlunde, Frederikssund, Denmark. Wikimedia Commons. Towards the end of the nineteenth century, socialism and other radical movements swept across Europe and the Nordic countries. 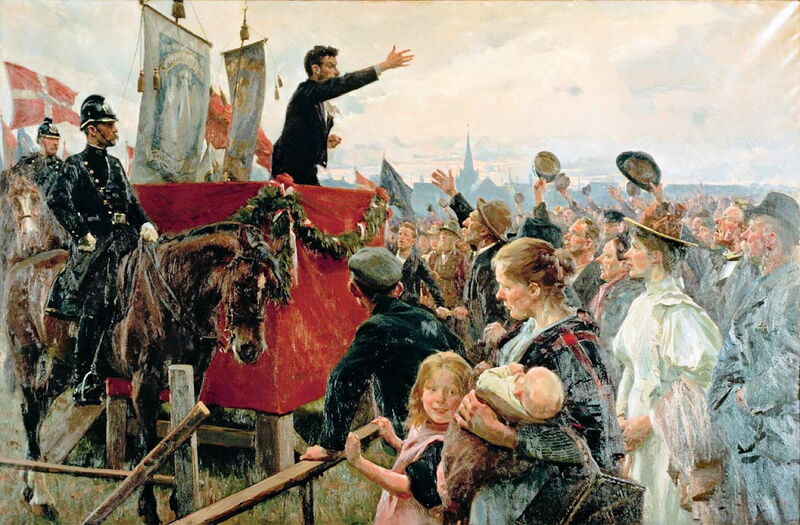 In An Agitator (1899), Henningsen shows one of the many campaigners of the day standing and trying to move the crowd in front of him. Interestingly the audience here appears drawn from across society, and not just from men of the working class. Mounted police are present to ensure that nothing gets out of hand. 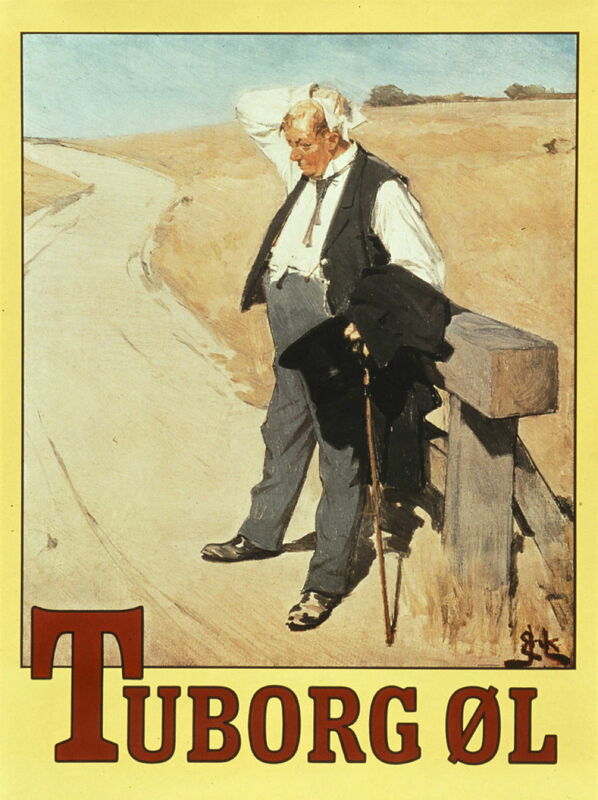 Henningsen’s poster of The Thirsty Man was his submission in Tuborg’s 1900 competition to celebrate its twenty-fifth anniversary. Surprisingly, it was unsuccessful, and the prize of 10,000 Danish Kroner was awarded elsewhere. However, it was this poster which was actually used to advertise Tuborg’s beers, and which remains in use well over a century later. Erik Henningsen (1855–1930), The Fire (1901), further details not known. Wikimedia Commons. 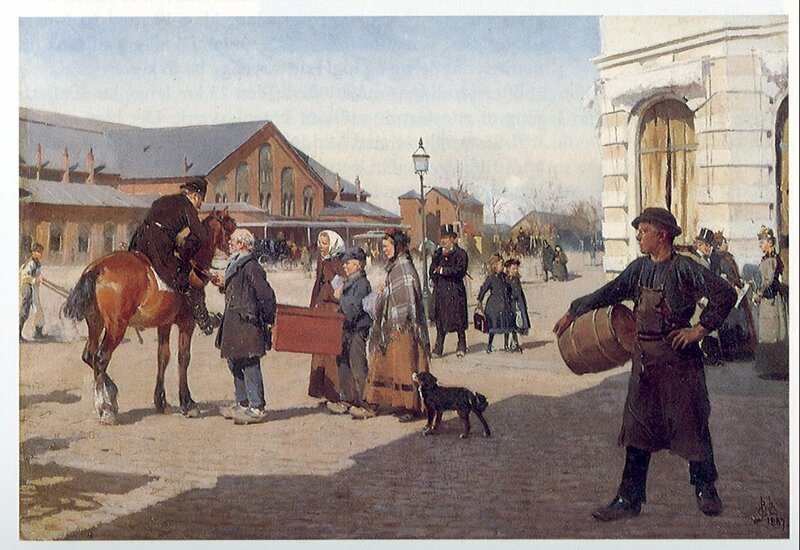 Henningsen returned to social issues in this painting of another family set out in the street with their possessions, this time the result of The Fire (1901). As firemen continue to damp down the blaze in a house, in a country town, two children comfort one another on their salvaged bed. Behind them their mother is pointing accusingly at an older, well-dressed man, who appears to be to blame for their predicament. Bystanders from the rest of the street stand back watching from the other side of the road. 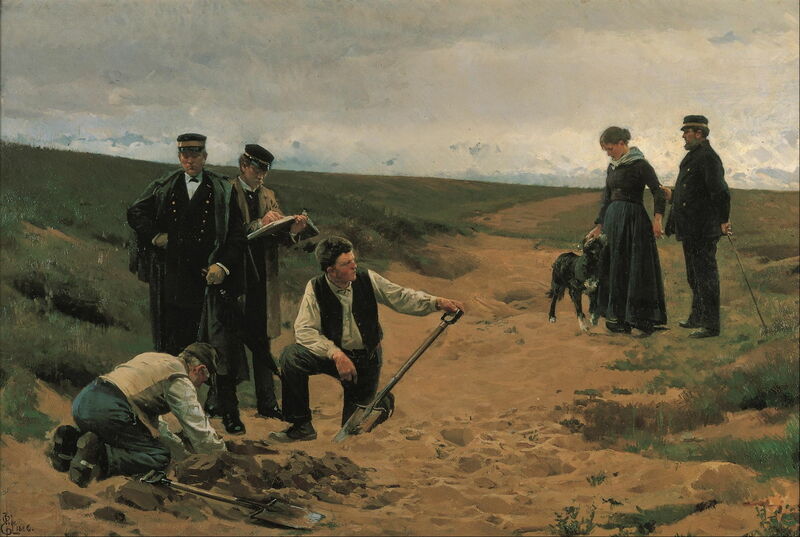 Henningsen also painted some conventional history paintings, and in the twentieth century apparently turned to genre scenes of the bourgeoisie, but this series of ‘social realist’ or Naturalist works puts him alongside the likes of Christian Krohg, and the many French artists who followed the lead of Jules Bastien-Lepage in the 1880s and 1890s. Yet I haven’t seen Henningsen or his paintings included in accounts of Naturalism in Europe or the Nordic countries. Posted in General, Life, Painting and tagged Bastien-Lepage, Henningsen, Krohg, naturalism, painting, realism. Bookmark the permalink.